Cheim & Read is pleased to announce an exhibition of new paintings by Monique Prieto. "As her paintings of the last decade bear evidence, Prieto rejects not only the possibility of a form/content split, but of a favored imbalance. Abstraction and representation cohabitate and co-depend in her works, which reveal an understanding, both intellectual and instinctive, that form reads, that it never can be divorced from content, and that all that can be read-all that is content-is so enabled to be read by form. Thus, while Prieto's move toward text might seem unexpected-either because one had mistakenly pigeonholed her in the territory of pure (or purist) abstraction, or because within the gray area between abstraction and imagistic representation, she seems to have done so much and have so much yet to do, in the end, the shift isn't so surprising. As representations and abstractions of their own sort, further represented and abstracted in Prieto's paintings, the words merely open and usher a new phase of her exploration. Prieto's attraction to phrases from the diaries of Samuel Pepys (1633–1703) also isn't so surprising. Born in 1633, the fifth of a London tailor's eleven children rose to upper middle management in British government. His diaries began in 1660 as a New Year's resolution, and continued until he stopped writing due to vision problems in 1669. The more storied bits of his life-his wife's discovery of his philandering shortly before her death, his promotion to Secretary to the Admiralty Commission, his two Tower of London imprisonments for suspicion of pro-French sympathies and Jacobitism, his role as confidante to two kings, and his forced retirement after James II fled England-occurred in his post-diary years. The diaries themselves are packed with mundane duties, anxieties, and personal challenges and excesses, punctuated with glimpses of the elite and powerful, and backdropped with then-current events that would have peppered the entries of any diarist of the day: the restoration of the monarchy, the Second Anglo-Dutch War, the Great Plague of 1665, and the Great Fire of London. Tucked away and finally transcribed from his shorthand and published until the 1820s, Pepys' diaries hold interest today as direct recordings of a 17th century English life. 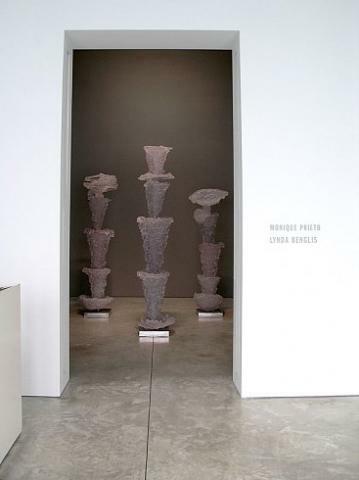 In the front gallery Cheim & Read presents THE GRACES by Lynda Benglis. This new large-scale translucent sculpture, her first in cast polyurethane, is composed of three elements each over ten feet in height. Known for her exploration of metaphorical, sexual and biomorphic shapes, Benglis is deeply concerned with the physicality of form and how it affects the viewer: soft becomes hard, hard becomes soft and gestures are frozen. In THE GRACES each spiraling segment stacked, tipped and shifting embodies her ongoing engagement with material fluidity. Lynda Benglis is also included in the Tate's current Summer of Love exhibition.